*DISCLAIMER: I know the title says "DSLR Made Easy - Basic Photo Editing" but that doesn't mean that these tips only apply to DSLR photography. I'm just keeping it as part of the already existing DSLR Made Easy series for ease of storage/recall of information. SO! Even if you only use a Point & Shoot camera [those are very powerful machines; you shouldn't be made to think otherwise! ], you might be able to learn something from reading these basic editing tips. They apply to all digital photography, regardless of the type of camera it came from. 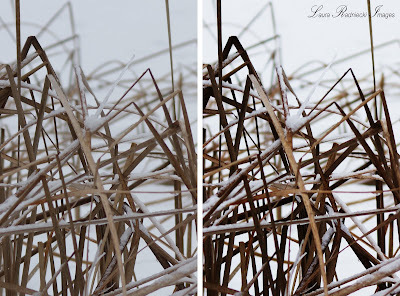 So, that said, I wanted to talk about a few of the most basic edits you can do to your photos. Almost every single photo, no matter who it’s taken from, can be made better through edits of some kind. In the digital age, the options are endless. Completely endless. Over editing is often a fad, and sometimes a problem, but because photography is art, it’s subjective. What you like, someone else may not, and vice versa. That’s part of the beauty of it. Color Temperature is basically a slider where to the left, it puts more cool colors/blues into your photo, and to the right, it puts more warm/orange colors into your photo. The time this is useful is if your White Balance is thrown off. [I guess I should maybe talk about White Balance; I haven’t covered that yet…] White Balance in a nut shell is how your camera interprets colors. It’s affected by the lighting in the space you are shooting. 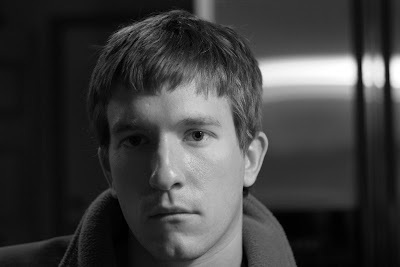 If you are shooting under fluorescent lighting, you’ll get a green color tint to your photos. If you shoot under regular light bulbs, you might have a yellow/orangeish tint to your photos. 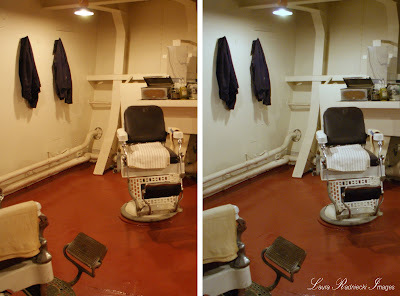 When Matt and I were touring the USS Alabama ship, the photos all had a orange/yellow [warm]ish tint to them. This was because of the lighting, and my Auto White Balance setting wasn’t compensating for the lighting. 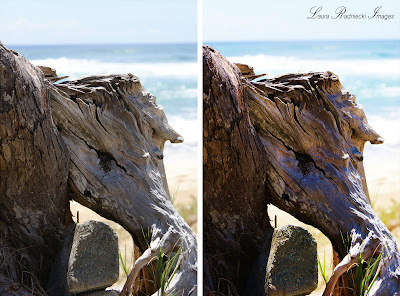 Another thing that Saturation can do [ok two things], is 1 – give your photo a de-saturated look. I had a shoot where I was photographing a family on the beach. The family all had white shirts and khakis on. The day was overcast, so the sky was kind of a light blue/gray. The ocean was a lovely blue and the sand of course, tan. I found that when I brought the saturation slider to the left a little bit, it took some of the colors out of the photo and because of the nature of the photos [subdued colors to begin with, classic family photos] it achieved a moody, lovely feel. I did this on many of the photos, and the clients loved them. I still love them! I'm thoroughly enjoying your tutorials, and am learning a lot. I also loved the inspirational minute. I grew up on that stuff, and always enjoy focusing on the positive. I may have to use it for a post. I'll link back if I do. Thanks for your tutorials! As you say folks react different to color; I like the first pic of the young man...w/the golden overtones. Also find the first USS Alabama pic more pleasing. Often I worry about what someone else would like instead of what I like. We forget that we are making art, not making an exact duplicate! Dana - absolutely post it on your site!! I LOVE positive/motivational things like that, and quote too [I'm a HUGE quote lover.] Spread the joy! And to anonymous [I wish I had a name to refer to haha!] That's a hard lesson for us all to learn sometimes - to NOT worry about whatever anyone else will like, but to do what WE like. That's the beauty of photography - we can do whatever we like!! I like to hear that others like the warm tones too, because sometimes it makes a picture look totally wacky to tame the gold tones. It's good to know that lots like the warm look! Found your site by browsing PW's photo comments. 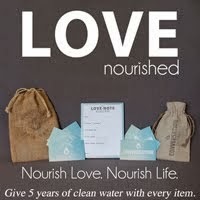 Excellent blog and very informational. My hubby suprised me with my first DSLR for Christmas; a Nikon D5000. The past week between reading PW's "What the Heck" series and your blog; it is all clicking. Will be checking back often. Thanks! 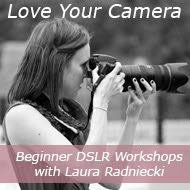 Hi Laura..thanks for your very helpful tutorials on DSLR's. I've learned lots from you simply because you are on the same page as I am only further along in the book!! Thanks for making things simple and for detailing like you do in your explanations. Also, you are working in programs e.g. Elements that I also am.. that a lot of us are. We'll never get into the full blown Photoshop either because of the time needed to learn it or the $$ to buy it. Plus, there is more in Elements than most of us will ever need or grasp...let alone tackling full Photoshop which is way more than my pea sized brain could ever figure out. You mentioned someone who has done some Elements actions. Can you give us the website address for whoever has put them together? Thanx!! And thanks for all you share. Please read it at your leasure, and let me know if I've helped or made the process worse! :) Trust me, it took me hours to master it too. I hope that maybe it can be a little easier for you because of my errors and learning experiences! I just successfully edited some very yellow pics using Windown Gallery. Am like so many folks - have all these tools and don't know how to use them.